A Prototype Cat named Choo Choo. The Lorna Bailey Art Ware Pottery Prototype Cat Choo Choo. This Lorna Bailey Art Ware Pottery Prototype Cat Choo Choo. Was produced by Lorna Bailey Art Ware in February 2003. In a design by Lorna Bailey. This is the prototype for the stockists piece. And it is noted Prototype on the base. In addition to it also being personally signed in black on the base by Lorna Bailey. All of the comical cats produced by Lorna Bailey Art Ware. Are made in their studio based in Stoke on Trent. They are all individually hand decorated. Which makes every cat produced different and unique. 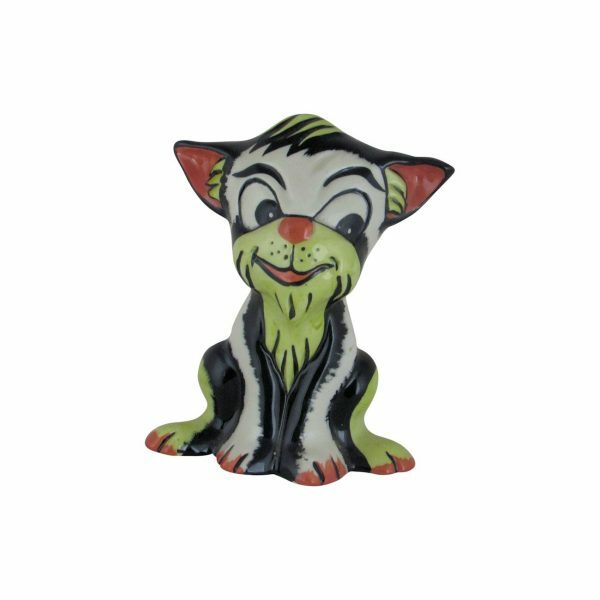 The height of this Lorna Bailey Art Ware Comical Cat School Time is 13cm. Which includes UK postage and packing. With a delivery time of 1 -2 days. You can buy with confidence. We offer a next day despatch service. Finally we offer a 14 day No Hassle No Quibble Money Back Guarantee.